When you need a Spokane home-away-from-home, the Marriott Residence Inn is just the place! Spacious rooms, many complimentary services and first class staff attention will make your stay an enjoyable one. Large suites offer a fully stocked kitchen with a conventional oven, dishwasher, microwave oven, refrigerator with icemaker and as many pots, pans and serving dishes as you will need for minor feasts. Air conditioning and individual climate control make each room just the right temperature and everything from alarm clocks to hair dryers and coffee makers make life easy. 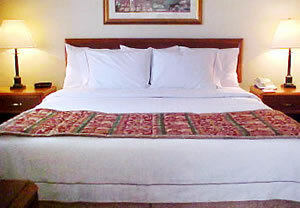 Down feather pillows and quality beds sooth the body to sleep each night. Complimentary services include a daily buffet breakfast, coffee/tea and newspapers in the lobby, and toll free phone calls. An evening reception provides a nice break at the end of the day. Need more entertainment? 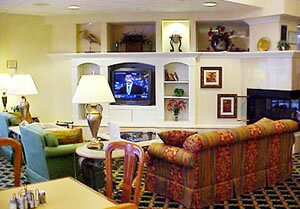 Each suite has a color TV with cable/satellite connections and featuring CNN, ESPN or movies. Relax with a good video in front of the in-suite fireplace. For a more ambitious day-end take a stroll along the Spokane River on the adjacent Spokane Centennial Trail or skip over to the Valley Mall for a little shopping. Then go for a dip in the indoor pool or a soak in the whirlpool. Location: East of Spokane in the Spokane Valley. Approximately 12 miles from downtown and 18 miles from Spokane International Airport. Easy access off Interstate 90 East or West, take exit 291B (Sullivan Road) north.